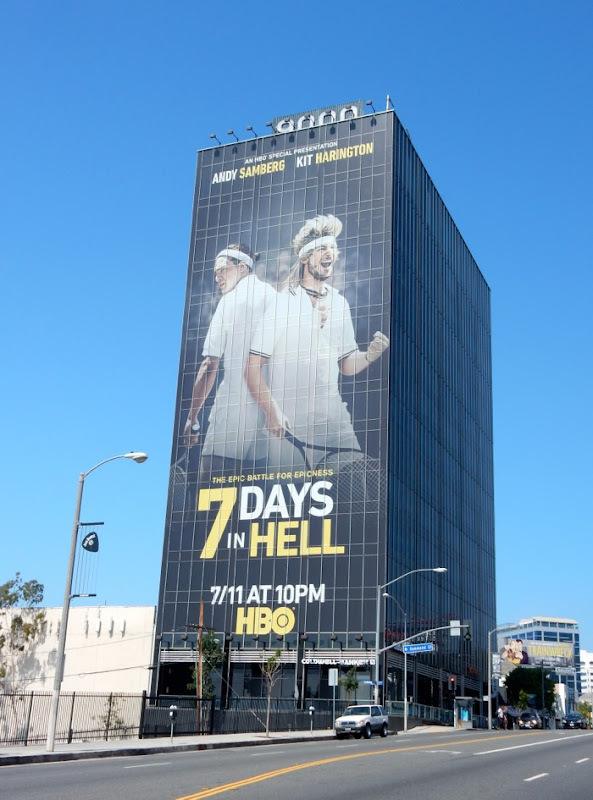 With the Wimbledon tennis championships currently taking place in the U.K., there's never been a better time for these epic billboards for HBO's film, 7 Days in Hell, to fill L.A.'s skyline. 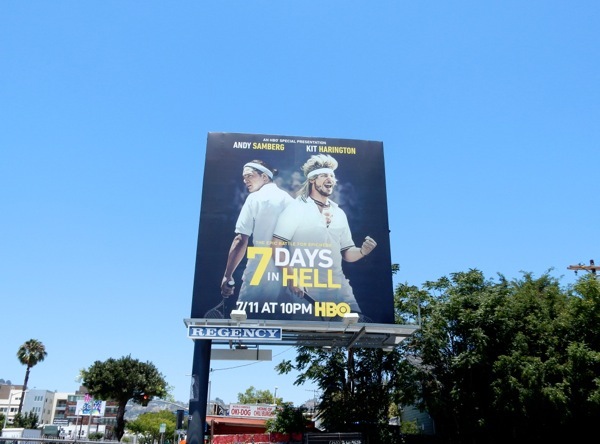 In this sporty mockumentary style TV movie, Andy Samberg plays the adopted American brother of real-life professional tennis champion, Serena Williams. 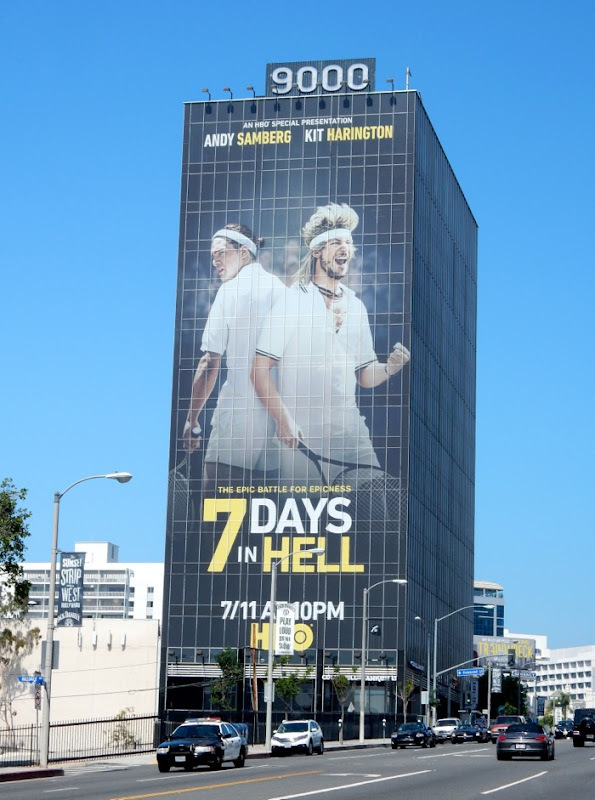 The Brooklyn Nine-Nine star plays 'Aaron Williams', who goes to head-to-head with Game of Thrones Kit Harington's bumbling British player, 'Charles Poole', trying to take home the Wimbledon trophy for his country in the longest and greatest game in tennis history. 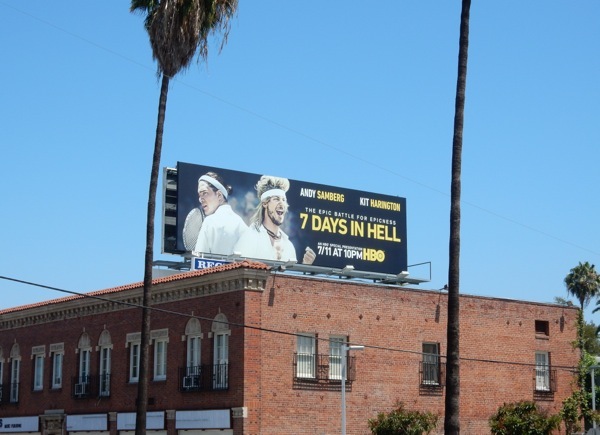 The sporty landscape billboard was first snapped along Sunset Boulevard on June 17, whilst the square ad creative for 7 Days in Hell was spotted along Fairfax Avenue on June 24. 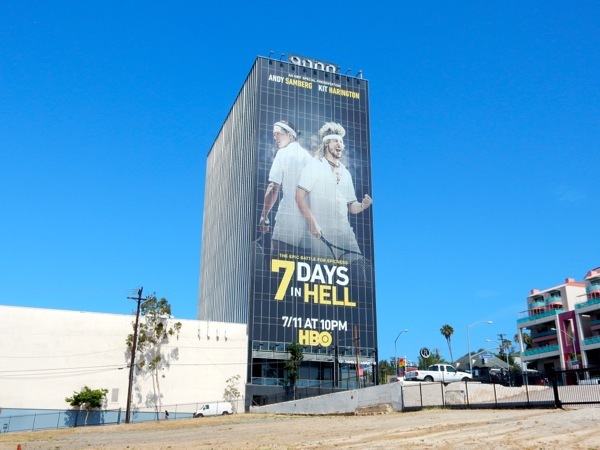 The super-sized ad version on the side of the 9000 Sunset Boulevard building towering over the westbound route of the busy commuter stretch was photographed on June 26, 2015. 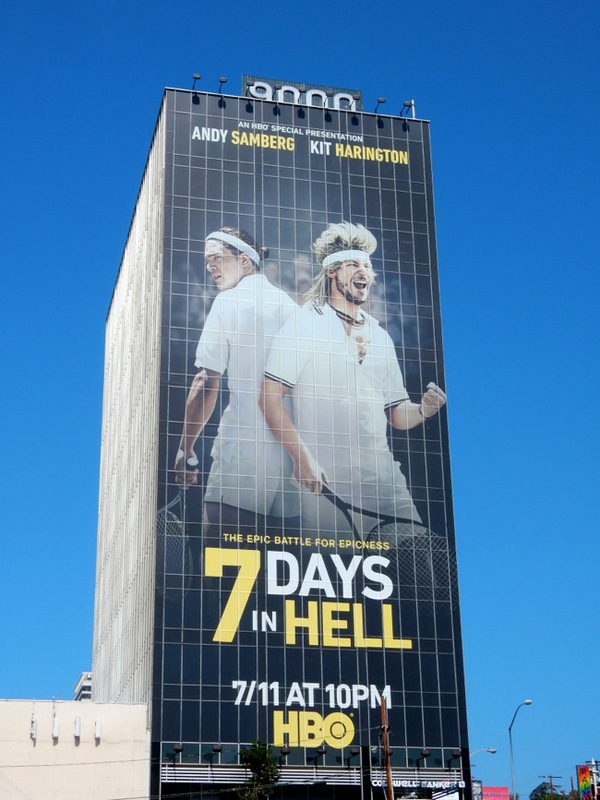 On a side note, one of Daily Billboard's pet peeves is when they put actors names over the wrong person on promotional posters. Obviously there's a whole bunch of contract negotiations and egos which goes into which order they go in, but it seems odd when there's only two people you can't just put their names above them to help identify them and avoid confusion. 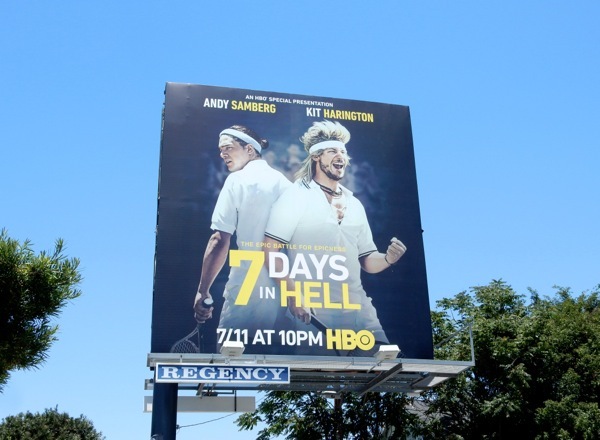 If you're a fan of Andy Samberg, be sure to also check out these Brooklyn Nine-Nine sitcom billboards and That's My Boy movie billboards. 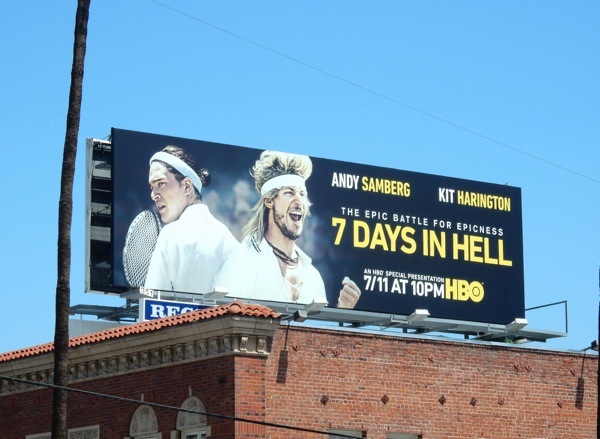 Let's hope this fictional tennis battle can serve up more than a few laughs this Summer. In the meantime enjoy this long Fourth of July weekend.